Gov. 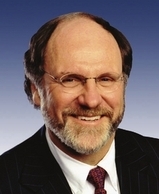 Jon S. Corzine (D-New Jersey) was in critical condition last night after his SUV hit a guard rail. A New Jersey state trooper was driving but was not seriously hurt because he was wearing a seat belt. Gov. Corzine was riding in the front seat but was not wearing a seat belt as required by New Jersey state law and his injuries are described by doctors as very serious even though they differ about whether the injuries are life-threatening. He has a broken collar bone, 12 cracked ribs that make it hard to breathe, and several craked bones of various kinds. Gov. Corzine was on his way to Princeton to attend the reconciliation meeting with fired talk show host Don Imus and the Rutgers Women's Basketball Team. Gov. Corzine, age 60, was profiled here on IR last fall as a famous Illinoisan because he was born on Jan. 1, 1947 near Willey Station, a small town near Taylorville, Illinois in Christian County. His father was a farmer and an insurance salesman and Jon was raised on the family farm. His mother was a public school teacher. Jon was a quarterback for the Taylorville High School football team and captain of the basketball team. He graduated from Taylorville High School in 1965. Corzine attended the University of Illinois at Champaign-Urbana and was a member of Phi Delta Theta fraternity. He graduated with a B.A. degree in 1969 and earned a Phi Beta Kappa key. Corzine had also joined the U.S. Marine Corps Reserve while he was still and undergraduate and went on a short period of active duty for training in 1970. He stayed in his Marine Corps Reserve infantry unit as a sergeant until 1975. While working days in the bond department of Continental Illinois National Bank in Chicago starting in 1970, Jon was also attending classes at night and earned his MBA degree from the University of Chicago Graduate School of Business in 1973. In 1975 Corzine moved to Bank One, a regional bank in Ohio and then moved his family on to Hoboken, New Jersey when he was recruited by Goldman-Sachs, one of the world's leading investment banks. Goldman Sachs was founded in 1869 and is headquartered in Manhattan at 85 Broad Street. The acting governor of New Jersey has asked for prayers for Jon Corzine's recovery. Jon Corzine previously served as a U.S. Senator from New Jersey.